Valerie Alia† was an award-winning independent scholar, writer, and Professor Emerita, based in Toronto, Canada. She was Senior Associate of the Scott Polar Research Institute, Cambridge University, Distinguished Professor of Canadian Culture at Western Washington University, and Running Stream Professor of Ethics and Identity at Leeds Metropolitan University. She was also a television and radio broadcaster, newspaper and magazine writer and arts reviewer in the US and Canada. Her books include: Un/Covering the North: News, Media and Aboriginal People; Media Ethics and Social Change; Media and Ethnic Minorities; and Names and Nunavut: Culture and Identity in Arctic Canada. She was a founding member of the International Arctic Social Sciences Association and founded the sub-discipline of political onomastics, the politics of naming. 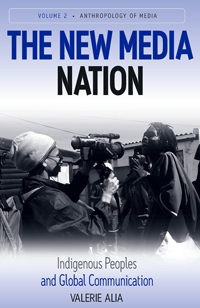 Related Link: Listen to Valerie Alia talk about New Media Nation in an interview on Public Eye Radio, British Columbia's only weekly radio show covering politics in Canada's westernmost province, hosted Sunday mornings on CFAX 1070 by award-winning investigative journalist Sean Holman.